First off, congratulations on the expansion of Spearman Artisanry. How do you like your new location on Main Street? Buying the old Buckingham & Flippin building at 919 Main Street has been one of our greatest decisions. We live and work there now. The community has welcomed us and we feel like part of a true family. Of course, in addition to our new location, we still maintain our original location inside the Lynchburg Community Market at 1219 Main Street where we have been for the last five years. 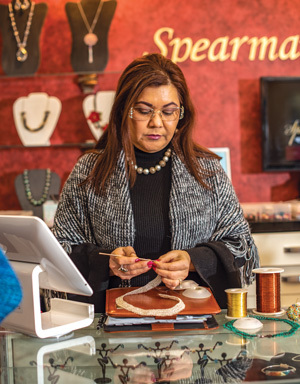 Your store revolves around your gorgeous handcrafted jewelry. How did you first learn to crochet fine silver? I continued my career in electronics by going into teaching in Lima, Peru, where I taught computers at an international Christian school. Loving to work with my hands caused me to explore the art of making jewelry. So, I enrolled at the Peruano Japones Art Center, studying jewelry design, merchandising and business administration. In those classes I learned glass fusing, weaving, leather working, felting, beading, painting, embossing, wire wrapping and other artistic skills. 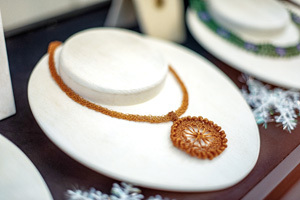 Ultimately, I embraced wire crochet for its sculptural, feminine and romantic characteristics. What inspires you to create a piece of jewelry? My inspiration for each piece is people. As I travel, I find myself being inspired by the different cultures in how they express themselves—not only in dress, but who they are as people. Some of them are very vibrant, while others are more subdued. This translates into unique creations for each individual. I even have product lines that I have named after people whose personalities have inspired me. About how long do you spend on each piece? It depends on the size and intricacy of the piece. Some can take me only a matter of minutes, while others may take days or weeks. 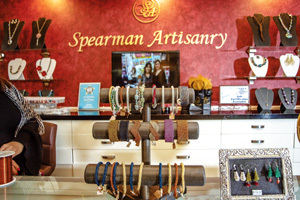 Spearman Artisanry is also a “fair trade boutique” selling accessories, home goods and clothing. Why is being fair trade important to you? Fair trade is important to me for several key reasons. First, fair trade helps lower poverty. Instead of receiving charity, people working in fair trade business relationships are building a stable income for themselves. Second, fair trade ensures ethical treatment of workers. In contrast to sweatshops, the artisans who make these goods work for themselves and are able to work out of their homes with family members or friends. Also, by purchasing directly from them, I can ensure the process and quality of the goods that are being produced. Third, fair trade helps people to thrive in their own countries, which is also very important to us. Connected to that third point, you also run a nonprofit alongside your business. While we do support local organizations such as the Lynchburg Historical Foundation, Friends of the Market, Downtown Lynchburg Association, Lynchburg Symphony Orchestra, Academy Center of the Arts, and Thomas Road Baptist Church to name just a few, we also support our very own nonprofit, Building Lives International (Tejiendo Vidas Internacional). It is through this ministry that we sponsor students in third world countries by helping them with their education and provide housing for them and their families. How often do you visit the countries of origin of your products? I visit at least three countries per year, not only to visit existing artisans, but also to search for others. We have a few plans. We are working with a marketing agency to help us increase our online presence and help us with our advertising. We want to work closer with the organizations within our community to help Lynchburg be one of the best places to live and work in Virginia. Finally, we want to be able to do more through Building Lives International by reaching more artisans in other countries so that we can minister to them and their families with educational opportunities and housing .